Grandma made a buttery version of these cookies every holiday and now my Mom has followed suit. At holiday time I used to sneak these cookies off of the dessert tray, even before dinner was served! This jazzy nondairy version is every bit as good as Grandmas’…and no one will EVER know it’s vegan! Preheat the oven to 350 degrees F. Line a large cookie sheet with unbleached parchment paper. Put the oat flour, walnuts and 2 tablespoons sugar in to a medium mixing bowl. Whisk together. Add the cold margarine and vanilla. Combine using a dough blender or large fork. Add the cold nondairy milk 1 teaspoon at a time, until the mixture becomes the consistency of soft dough. Form into a log. Put the dough log in the refrigerator and chill for 20 to 30 minutes, or until almost firm to the touch. Slice into 1/4 inch slices. Place on the cookie sheet and form each cookie into a crescent shape. Bake for 7 minutes, then turn the heat down to 300 degrees F. Bake 10 to 12 minutes more, or until slightly golden around the edges. Meanwhile, pour the confectioner’s sugar into a medium size bowl. 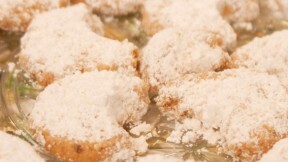 Remove the cookies from the oven, cool 4 minutes, then roll each cookie in additional confectioner’s sugar. Place on a pretty serving tray. Store leftover cookies covered in the refrigerator. NOTE 1: To make oat flour, place 1 ½ cups rolled oats in a blender and process until consistency of coarse crumbs. Proceed with recipe as directed. NOTE 2: For ground walnuts, place 3/4 cups chopped walnuts into a blender and process until consistency of coarse crumbs. Proceed with recipe as directed.